Spooltek lures have been working as well. The best snook action has been found recently working the docks along Sewall’s Point during either incoming or outgoing tide. As long as the water is moving.The trout fishing in the Jensen Beach area is also still excellent. Big ‘gator’ sized fish are out there with the best luck being had in the Bear Point to Fort Pierce area. Pompano action along the bridges has been good. Slightly heavier jigs, around 3/8 to ½ ounce, have worked best to get the proper fall rate to attract fish.In Jupiter, snook fishing has also been outstanding. Keeper fish are being caught in the Intracoastal Waterway as well as the very clear water of the Loxahatchee River. Anglers working the docks and seawalls in the evening are having the best luck.Along the beaches in the area, bluefish are being taken on spoons. Also along the beach, schools of jack crevalle are moving through. With the windy conditions best bets are the Juno Pier or the jetty at the inlet.Off of Jupiter Island, the pompano fishing is still good with anglers having getting good results using cut clams and sand fleas combined with Fishbites. 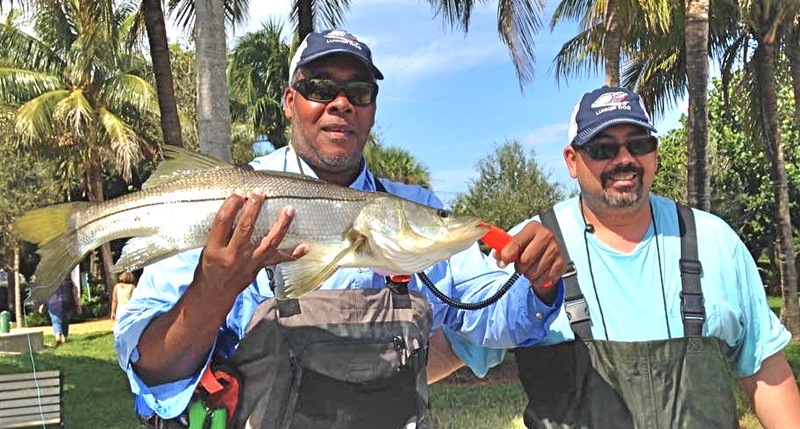 Along the beaches in Boynton Beach and the inlet, there has been little action.In the Intracoastal Waterway in the area, there have been a few tarpon rolling. Though the lake has been rough with the windy weather, the fishing is still excellent.There are plenty of bass to be caught and anglers are still having the best luck using live shiners. If going with an artificial bait, however, swim jigs and rattle traps are working well.The bluegill bite has backed off now that the full moon is waning, but will pick back as the new moon approaches.